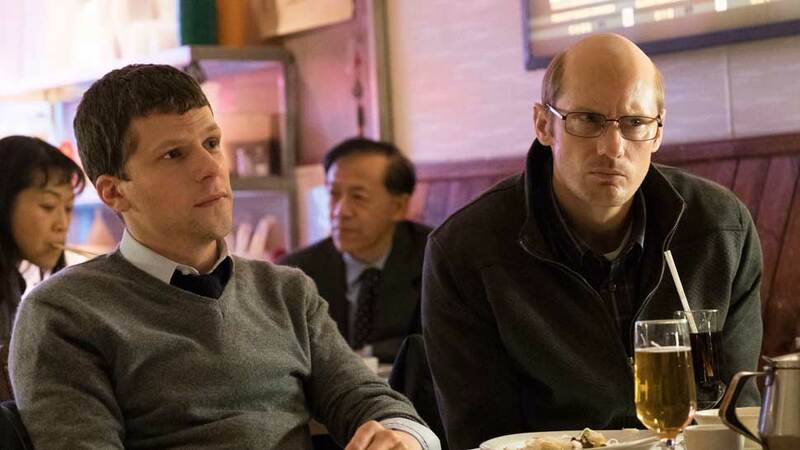 The Hummingbird Project (L to R) Jesse Eisenberg and Alexander Skarsgård. Courtesy of The Orchard. 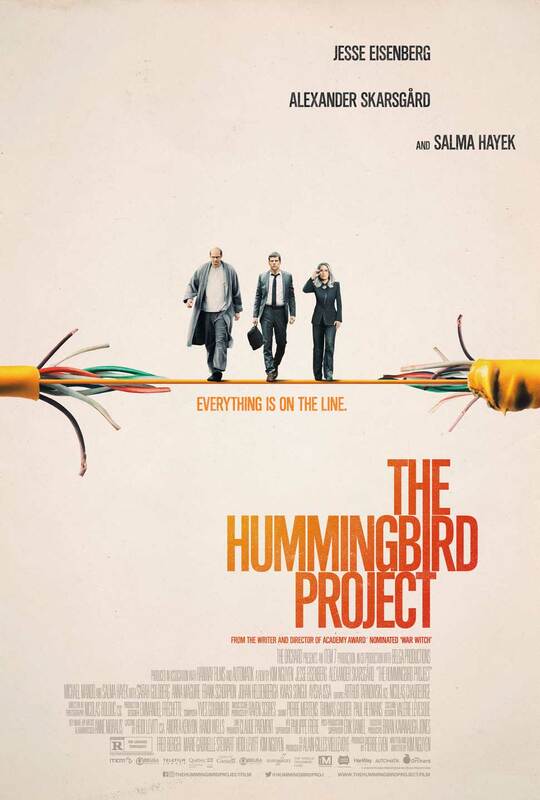 Ambitious and gripping, “The Hummingbird Project” is a surprisingly accessible film, considering its construction around intricacies of modern technology and electronic communication. Get past the technobabble, and it’s a film about greed. It’s about ambition, obsession, and competition. Those very relatable human traits drive the film’s true drama. They pull audiences in, thanks to a terrific script and stellar performances from its small ensemble. Don’t let the seemingly esoteric title fool you. This film’s got a universal message, and it conveys that message with potent intensity. Jesse Eisenberg (“The Social Network“) and Alexander Skarsgård (“The Legend of Tarzan“) star as Vincent and Anton Zaleski, cousins who work in New York in the high stakes world of high-frequency trading. Vincent is the talker, the pitchman, the visionary. Anton, meanwhile, is the engineer who can turn visions into realities. Together, they embark on a project that could set each of them financially for life. They’re out to build a unique fiber optic line so fast it will put them ahead of all other traders by milliseconds. In other words, they’re out to beat the system as well as make millions of dollars. Standing in their way is Eva (Salma Hayek, “Beatriz at Dinner“), their old boss. Eva did not take kindly to the way the Zaleskis left her employ and she’s not about to see her own financial outlooks take a hit due to their scheme. Thus, the race is on. As the Zaleskis each tackle new logistical and personal obstacles in the path towards making their line a reality, Eva works feverishly to both sabotage them and create an advantage for herself in the market. The stakes were already high. Eva’s machinations make it personal. Who will win? In the hands of a less capable film maker it’s easy to see a story like “The Hummingbird Project” losing its way. It’s a tough sell to begin with: tell a potential viewer it’s a movie about building fiber optic cable and you’re likely to feel the eye roll even before you see it. Thankfully, the film comes from Oscar-nominated writer/director Kim Nguyen (“War Witch“). Nguyen keeps the film laser-focused on the emotions that drive the film’s characters. Greed is a significant part of that drive, but it’s only a part. Vincent, Anton, and Eva all have very different motivations for what they do beyond the potential financial benefits. Nguyen’s script and direction coax riveting, nuanced performances from his principals that ratchet up the film’s intensity as the stakes climb. What he puts on screen isn’t flashy or visually driven by any means, but it is fun to watch. Speaking of the performers, the acting trio at the heart of “The Hummingbird Project” each depart from type in their own ways here. Their efforts at bringing to life characters that defy our expectations add to what audiences have to look forward to here. For example, Eisenberg’s Vincent may at first look and sound a lot like fast-talking hustler characters he’s played before. By the film’s end, however, he’s drawing on a deep reservoir of raw emotion. You may find yourself cheering for him late when things don’t go his way. Hayek, too, has played ruthless characters in the past. But she plays Eva with a cold fire palpable even through the dark eyeglasses she wears throughout the film. The most stark against-type performance, though, comes from Skarsgård. His physical portrayal of Anton — balding, stooped, soft-spoken, and skittish — all are striking when coupled with the performer’s natural stature, intensity, and charisma. There’s a lot to like in “The Hummingbird Project” once you look beyond its somewhat intimidating premise. Naturally, you enjoy financial thrillers you’re sure to find the merits in this film. But even audiences without a proclivity for that genre may want to give “The Hummingbird Project” a try just for the cast involved. Working off a top-notch script, they run with this, turning it into a compelling tale driven by interesting characters and universal themes. It’s good stuff, and it should leave you looking forward to this director’s next project, whatever it may be. Starring Jesse Eisenberg, Alexander Skarsgård, Salma Hayek. Directed by Kim Nguyen. Rated R for language throughout.